The Airplane with the "Deflection slipstream concept"
Louis Breguet belonged among the industrial giants that always mastered the technical problems, as decision-makers they aimed at new objectives and program developments. Those were the traits of a past era. The economy of the present now prevails. Louis Breguet, an aristocrat of the Aeronautical Industry was one of those "Master-Strategists". By selecting his engineers, he knew that his directives would be followed to the letter. He was appreciated and esteemed by all. His influence and his authority were recognized. One of his most devoted colleagues was Georges Ricard. The 1001 "Taon", a single-seater tactical support aircraft first flown by Bernard Witt at Melun Villaroche on the 26th of July 1957, achieved a year later on the 23rd of July 1958, an International speed record, flying a distance of 1000 kilometers at 1076 kilometers per hour, still piloted by Bernard Witt. A great reference for Breguet. Pre-occupied by the problems that often plagued conventional aircraft utilization, Louis Breguet searched for new solutions, which explain his interest for helicopters at the beginning of his career. A passionate for research, he imagined way back in 1948 an aircraft possessing characteristics and performances out of the conventional realm. He created the concept of an airplane capable of short field takeoff and landing (STOL). He found the technical solution and invented "l'aile soufflée" (which can be approximately translated as the ventilated or blown wing). This was accomplished by equipping the prototype with full span "Venetian blinds" or slotted flaps, which could be extended up to an angle of 97 degrees. The engines powered over-sized propellers, producing an enormous airflow which was deflected downward by the flaps, creating additional lift. As simple as the concept seemed, the technical application was not. The flaps system had to be designed to eliminate all risks of asymmetry. A single actuator was required, and would be designed by Jacottet-Leduc. Likewise, the synchronization of the Ratier-Figeac propellers had to be full proof, even in case of one of the Turboméca "Turmo II" engine failure. Consequently, Hispano-Suiza developed a concept of single transmission. Finally, to cancel all propeller adverse effects, the inboard engines rotated clockwise, and the outboard engines counter-clockwise. A 1/75-scale model permitted the first investigations; followed in1954 with a 1/6 motorized radio controlled model, extensively tested in free flight in the private wind tunnel owned by Breguet in his Villacoublay factory. This first phase of studies took place under the greatest of secrecy, despite being financed by a government grant of 210 millions Francs. It was evident that Louis Breguet wanted to avoid "leaks" leading to potential competition. 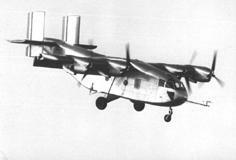 The wing of the prototype Breguet 940 being tested was entirely equipped with the Turboméca "Turmo II" turboprops, for a long bench-test program of endurance and reliability for this concept. In the meanwhile, the 940 prototype was being built at the Villacoublay factory since 1957. After the ground tests, this compact and rustic looking prototype performed its first flight on the 21st of May 1958 at the Villacoublay airport. Bernard Witt and test mechanic Georges Evrard made a 25 minutes prudent flight in a classic configuration to evaluate the characteristics of this 7 tons aircraft. In 1959, several flights confirmed the interest for this concept. In June, Witt even made a demonstration at the Le Bourget airshow, resulting in a general amazement while performing unusual low speed maneuvers. On the 23rd of February 1960, Breguet received an order for a serie prototype with a more refined design capable of transporting 48 passengers or metric tons of freight. It had to be powered by four Turboméca "Turmo III D" of 1200 horsepower each. This aircraft performed its first flight on the 1st of June 1961 at the Toulouse-Colomiers airport where Breguet owned an industrial plant. The flight-testing would hence continue on a constant basis. McDonnell Aircraft Corporation intrigued by this revolutionary program establishes contact with Breguet, and on the 6th of June 1962 signed an important agreement of cooperation regarding the 941 and its eventual derivatives. 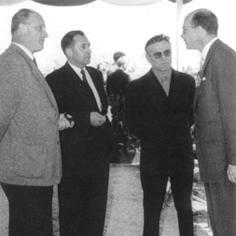 A few days later, Bill Roos the chief pilot of the American firm arrived in Toulouse accompanied by Colonel R. Allen of the US Air Force chief of staff. They came to check out on the 941 and to consider the possibilities of a mission of presentation in the USA. At the CEV (Centre d'essais en vol or Flight Test Center), the designated pilot for the official flight tests was Claude Chautemps, a licensed engineer par excellence, a graduate of Sup'Aéro (famed French Aeronautical Engineering school) and a very experienced pilot. 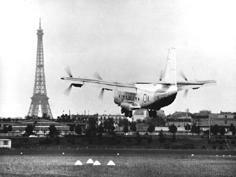 The first flight took place at Brétigny on the 21st of August 1962. The following year, the 940 and the 941 models were simultaneously presented in flight at the Le Bourget Airshow. An big meeting followed the demonstration campaign because an important mission awaited the 941 in the United States under the stipulations of the contract signed in June of 1952 with McDonnell. To satisfy the "need of the cause", the airplane received a new livery as required by the American firm whom baptized the STOL "McDonnell 188", and the Breguet 941.01 name would only remain on the vertical fin! The departure from Toulouse occurred on the 6th of June 1964. The crew consisted of; Bernard Witt first pilot - Gérard Joyeuse engineer and test pilot - and Paul Jaillard commercial technical engineer. With a cruise speed of 400 kilometers per hour and a range of more than 2000 kilometers, the 941 stopped at Prestwick - Keflavik - Sondoestrom and Goose Bay before reaching the United States on June 9th. Presentations to the negotiators and military authorities began on the 12th at Andrews Air Base near Washington DC. Demonstrations continued with increased frequency at Eglin Air Force Base in Florida from June 15th to July 6th for a more comprehensive evaluation by the "Special Air Center" consisting of 39 flight hours and 214 landings. After visiting two other US Air Force Bases in Florida, the 941 achieved a brilliant success at the Saint Louis Independence Day airshow in front of 150,000 spectators, which coincided with the 25th anniversary of the McDonnell Company …the reason for which the President James S. McDonnell insisted on flying aboard the 941. The air System Command at Wright-Patterson Field near Dayton Ohio was visited next for evaluation. 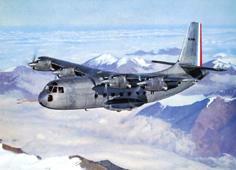 In 32 days, the French airplane flew 101 hours and performed 312 landings. The planned program was coming to an end. During one of the last planned flight, Colonel Lindgard an experienced American test pilot for no explainable reason abruptly brought the propellers levers into reverse, breaking the safety latch! The airplane was on final at an altitude of about 30 feet with the airspeed less than 100 kilometers per hour. Gérard Joyeuse did not have the time to intervene. The airplane dropped abruptly, the right wing broke, the main landing gear ripped the fuselage and an engine caught fire with fuel spilling into the fuselage! Repairs would take place at the McDonnell works but would require eight months… which would give time for several American technicians to explore the structural features of the Breguet. Finally, on the 25th of February 1965 the airplane after extensive repairs resumed the interrupted program and continued its demonstrations in Georgia, Florida, Virginia and at last in Washington DC where NASA, the FAA and miscellaneous branch of the military were anxious to make its acquaintance. When the "McDonnell 188" returned to Villacoublay on the 16th of April 1965, it had flown a total of 117 hours 35 minutes and revealed its secrets to the elite of the American aeronautical industry. 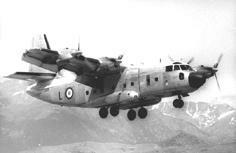 Having reclaimed its original name, the flight demonstrations of the Breguet 941 continued to increase. In November 1965, it was returned for general overhaul and received the new 1500 HP Turmo III D 3 engines, replacing the 1250 HP III D. It had now accumulated 620 hours and 2351 landings on 753 different fields. Could anyone have asserted then that the concept developed by Louis Breguet was not still "fine tuned"? Or, was the concept too far ahead of its time? 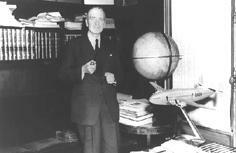 (Unfortunately, Louis Breguet passed away on the 4th of May 1955 and never saw the 940 flying). A government contract signed for the construction of four airplanes permitted to launch the construction of the Breguet 941 S in the Biarritz works (Pyrénées-Atlantiques region). Bernard Witt would fly the first model, stretched by 1.52 meters, on the 19th of April 1967. After about 100 hours flying time, the 941 S number 1 was transferred to the hands of the CEV (flight test center) team at Istres. For the occasion of the XXVII aviation show, Breguet provided the 941 and two 941 S for a combined demonstration with fully armed military personnel in one airplane, and military vehicles in the other, while the commentator emphasized that theses airplanes were fully loaded…which was not usually done at the aviation shows. Breguet did all possible work and seized all opportunities to promote the concept of his STOL aircraft, thus opening new possibilities for feeder airlines and the use of smaller airports while flying at lower altitudes than those required for conventional air traffic. It is under this spirit of cooperation with McDonnell Douglas, that another mission to the United States was organized, this time using the Breguet 941 S number 2. The goal was to permit Eastern Airlines, American Airlines and the FAA to experiment the 941 under the conditions and requirements of commercial aviation. 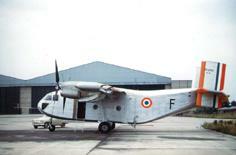 It was also an occasion to appreciate its use and practicality among the conventional traffic at the large airports. After its arrival on the 31st of July 1968, the airplane first entered the paint shop to receive its American colors, unfortunately totally covering up the name Breguet! The French team consisted of Jacques Jesberger the pilot, Gérard Joyeuse the aeronautical engineer, Pierre Arquin the flight engineer, Raymond Derimay and Yves Delrieu for the mission coordination. Warner Lowe participated to the mission as the pilot for McDonnell Douglas. During the FAA investigations, a new accident occurred due to the brutal force applied to one of the wheel brake by an American pilot. The Messier landing possessing very much-appreciated soft characteristics to handle unprepared field caused the airplane to bank. During the roll, one of the large propellers hit the ground and lost a blade, which pierced the fuselage injuring one of the test crewmembers in the process. (This accident occurred on the 19th of November 1968.) It would take four month before the 941 S could fly again. Taxi and approach procedures would be tested using a relatively reduced ground infrastructure. Spectacular demonstrations in the big urban areas were conducted during this campaign that ended on the 21st of June 1969. During the four months when the airplane was operational, it flew 350 hours. Demonstrations would continue in France with the participation of the civilian aeronautics, airports managers, and the French Air Force. It was now a question of developing new and original navigation systems adaptable to the 941, and to integrate it without problem into the existing air traffic presently used. This specialized equipment had been tested successfully during the American campaign. Let us not forget that the era was 1969…still a long way to solve the navigational problems as it is today with the use of satellites and GPS. Why is it, that after so many convincing experiments, so many proofs of reliability of the 941, so many evident advantages offered for the problems of air traffic control in zones of high density air traffic, why is it indeed that the Breguet 941 did not succeed? Too advanced, too far ahead of its time? Maybe. Too many unknown from an economical standpoint? There is no denying that the technical solutions adapted to the aircraft were complex and expensive, resulting in high maintenance costs. Too many problems in urban areas? It is a valid argument. Where to establish landing areas? How to determine the flight path to reach those "mini airports" without provoking the reaction of the local populace regarding noise and danger? 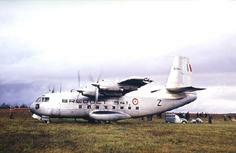 Taking into consideration that commercial airlines exploitation of the Breguet would not be feasible, but that the aircraft already built presented a rich potential, they were transferred to the French Air Force. They would now display the French tricolors on their military camouflage. This "miracle aircraft" which permitted to fly missions night or day, in areas of difficult access where no other aircraft could operate rapidly seduced the military crews. The last of the Breguet 941s reached the end of their potential 1n 1974, after flying and amazing the aircraft Industry for fourteen years. The Company McDonnell-Douglas was likewise seduced by the Breguet 941 since they later applied its technology to their four-engine YC 15, introduced in flight at the 1977 Le Bourget airshow. Yet, this prototype would be also abandoned. And so it is, that aeronautical technology very often results in bitter deceptions. Louis Breguet in front of a scale model of his Br 763 "double-deckers"
The integral wing was definitely a new concept: each of the "free turbine" engines drove an independent shaft which was connected to a master shaft, and in return, this master shaft was connected to the propellers. 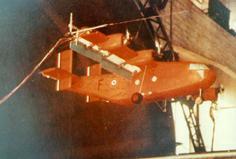 The free flight scale model of the Breguet 940 in the Chalais-Meudon wind tunnel in 1958, in the landing configuration. Breguet 940 in the landing phase. The military 941 S in 1967. Its "Blown wing" technology permitted its operation on very short fields, which were inaccessible to other classical aircraft. 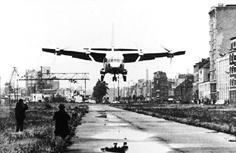 The most important feature of the Breguet 941 was mostly its capability to takeoff and land in urban areas, such as here at Issy-les-Moulineaux (France). In 1964, tests had been conducted with the goal of establishing a line between the heliports of Paris Issy-les-Moulineaux and Brussels Allée-Verte. 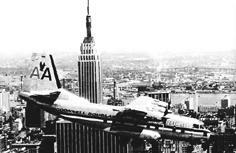 A Breguet 941 over New York. 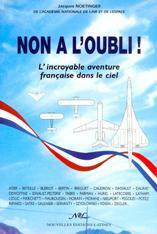 Of French origin, the airplane has "lost" its identity to the "benefit" of McDonnell Douglas. Two US Airlines were interested in the Breguet 941: Eastern Airlines (above photo) and American Airlines. 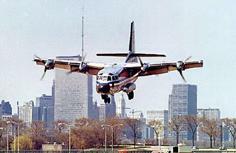 An American Airlines Breguet 941 in the landing phase in the middle of a US Urban area. 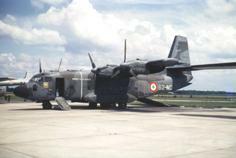 The "STOL" capabilities of the Breguet 941 S and its potential was of great interest to the French Air Force.